The Ipad Prompter for Light Stands, from Onetakeonly, is a collapsible prompter and very compact teleprompter for all iPads measuring up to 10″ diagonally, including iPad mini (iPad Pro is not supported).This teleprompter also supports all other similarly sized tablets. When it’s collapsed, it’s flat and only 1.2″ thick, making it very easy to carry in most bags or simply in your hands. 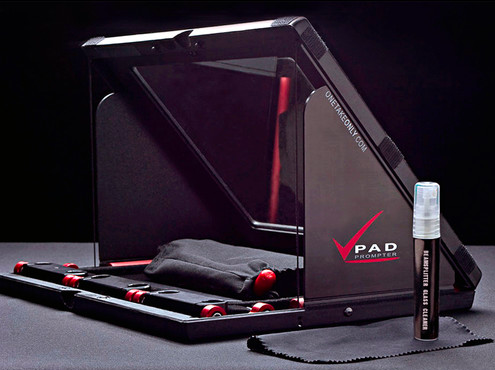 This Pad Prompter is designed to be used on a light stand (not included), with your camera on a tripod positioned right behind it. This teleprompter features a light stand mount on the bottom with 1/4″-20 and 3/8″-16 threaded holes compatible with a variety of light stands. 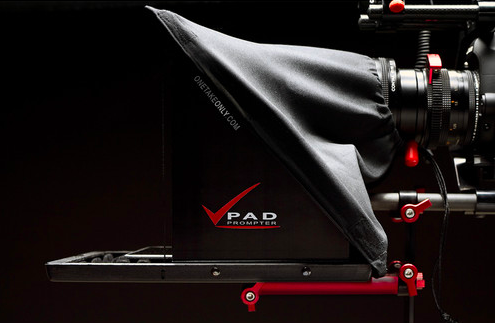 Once you’ve got the Pad Prompter mounted on a light stand, lift open the top cover and insert your tablet in its place. 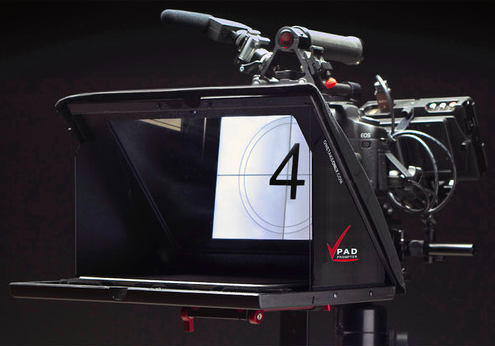 Then place your camera on a tripod behind the Pad Prompter, position your lens right behind the lens opening on the top cover, and you’re ready to go. The included 70/30 beamsplitter glass installs into the top cover right in front of the lens opening and can be kept in there even during transport. A cloth hood is also included for covering the lens opening to block unnecessary light. It is designed to be attached to the top cover by optional touch fasteners. All you’ll need in addition is a prompting software. If you’re using an iPad, you can use any iPad-compatible software available at the Apple App Store. If you’re using any other type of tablet, you can use any software compatible with that tablet. A soft carry case is also included for transport.